Poodles have been around for hundreds of years with historical references pointing to many European countries including Germany, England, France and Italy. They were bred as a type of water dog and skillful in many dog sports. The word Poodle is thought to come from the German word ‘pudel,’ which means splashing in water. The Poodle comes in three varieties: Standard Poodle (oldest variety used as a water retriever), the Miniature Poodle and the Toy Poodle. The breed has become a very popular one as a show dog and especially in grooming competitions. 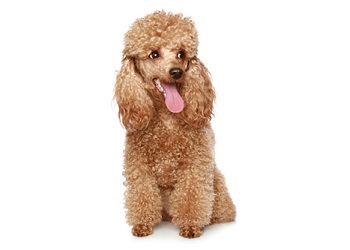 A Poodle’s temperament is friendly, intelligent and one that loves to please its owner. They are great family pets as they love being surrounded by people. They do need discipline and guidance which is why training is very important. They are quite rambunctious until the age of 18 months when they mature. The Poodle requires a great deal of exercise as their energy levels vary from moderate to high. They enjoy brisk walks, running, swimming and wrestling to keep them fit and happy. Poodles are alert and intelligent making them great candidates for being a watch dog. They look out for their families and are very loyal. However, their friendly nature makes them not a good guard dog. Because Poodles like to please their owners they pick up commands quickly. They need challenges so they don’t get bored. They love agility and obedience exercises as these keep them both mentally and physically active, as well as an opportunity to socialize with other dogs. Poodles are by no means low maintenance. The Poodle’s coat is unlike other animals; their coat is much like wool (great for asthmatics) as it never stops growing. As the pup grows so does the time required for grooming. Grooming is required for Standard, Miniature and Toy Poodle every four to six weeks, this includes a thorough bath and clipping of fur and nails. The Standard Poodle goes through a coat change between the ages of nine and 18 months. During this time you will need to brush your Poodle daily to prevent matting and tangling. Because of their high energy levels Poodles need a fair bit of exercise. They need to be stimulated both mentally and physically, so a short walk will not suffice. You will need to be prepared to put in the time to go for daily brisk walks, jogging or for a play at the dog park. If you put your Poodle in an agility program it will excel and love you more for it. Poodles are adaptable breeds and love human interaction so they are very well-suited to most people, so long as they are prepared to put in the time to train and exercise their dog. The elderly may have trouble keeping up with the breed’s energy levels. A Poodle is suited to living in an apartment, as long as they get plenty of exercise so that they don’t become bored and restless at home. Common hereditary problems Cushing’s Disease, hypothyroidism, Addison’s Disease, juvenile cataracts, hip dysplasia, patella sub-luxation and sebaceous adenitis.